It was a Saturday full of mixed results as New York Ranger and New York Islander prospects left more questions unanswered than you would expect for this time of the year. Well except 2 prospects who I have been developing some serious man crushes on. Ryan Pulock (NYI 2013 1st) of the Brandon Wheat Kings has made me into a big fan of his as the more I watch him play then the more I see a seriously solid NHLer who if developed right will be a dangerous weapon for the New York Islanders. Pulock has been trying to carry the Wheat Kings on his back for the last month while the team was drowning in player injuries. Today's NHL is full of players who can pile up the stats but players who when their team needs it the most bring their "A" game are in short supply. 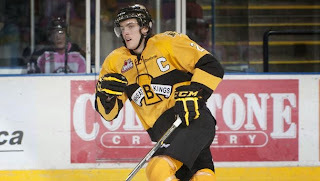 Pulock is a guy I want on my team in a "must win" situation because he will bring his "A" game as he has done the last 3 nights with his Brandon Wheat Kings just about ready to fall out of the WHL playoffs. Against Regina on Saturday with the Prince Albert Raiders and Red Deer Rebels ready to pass them, Pulock earned the game's 2nd star with a 1-2-3 +3 effort to lead Brandon to a 6-3 win and the number 7 seed in the WHL's Eastern Conference playoffs. Pulock had 2 secondary assists but his goal was the game winner, a blast from the point on a 2nd period power play that put Brandon up 4-2 at the time. It was Pulock's 23rd goal of the season and his 63rd overall (4th among WHL defenseman) as Pulock is the leading scorer among Islander prospects. But more importantly, Pulock was the player in crunch time as he recorded 8 points in his last 3 games (All Brandon wins) in games Brandon had to have. A 1-3-4 game against Saskatoon on Tuesday, setting up the overtime game winner Friday night and Saturday's game winning goal. That is the kind of player you want on your team, the guy who ups his game when a win is demanded. Nick Latta (NYR 2013 ATO) isn't an official prospect of the Rangers as he is going to join the Hartford Wolfpack as soon as Monday but hey this is a nice way to introduce himself as Latta scored twice in his final game as a member of the Sarnia Sting. It was in a losing effort as the Sting lost to the Erie Otters 8-4. Latta tried to keep the game competitive as the Sting are finishing the season with the worst record in the OHL. Latta got the Sting on the scoreboard with his 37th goal of the season at 11:11 of the first period to tie the game at 1-1. It was an even strength goal for Latta as Erie would take a 2-1 lead into the first intermission. In the 2nd with the score 3-2 in favor of Erie, Latta would tie it again with his 38th goal of the season at 15:39 and it was also at even strength. Unfortunately Erie would regain the lead with a goal just 8 seconds later at 15:47 and would not look back. Latta finishes his OHL season 38-28-66 as he heads to Hartford and he could be a help on the offensive end. The question is going to be defensively as is he strong enough to handle the older AHL players? It was a meaningless game for the top ranked Minnesota Golden Gophers but Brady Skjei (NYR 2012 1st) still played hard and even though Minnesota would lose 6-2 to 13th ranked Michigan, Skjei earned the game's 3rd star. Skjei scored both goals for Minnesota in the loss as he recorded his first multi-point game of his NCAA career. Sure Skjei's goals came when the game's outcome had been long been decided but he was still playing hard despite being down 5-0 (when he scored goal number 1) or 6-1. And it was Michigan's press box who named Skjei the 3rd star on the road. Skjei is now 6-5-11 on the season as now Minnesota gets a bye in the first round of the Big Ten Tournament as they await the winner of the Ohio State/Michigan State game next Saturday. Adam Pelech (NYI 2012 3rd) signed his Entry Level Contract with the Islanders on Saturday and then put up a +3 for his Erie Otters as they defeated the Sarnia Sting 8-4. The contract was well deserved and to be honest should have been signed sooner as Pelech earned with some solid 2 way play. Teammate Troy Donnay (NYR 2013 UFA) had a assist on Erie's 8th goal and was a +3 as well. Donnay finished the season 2-17-19 which are career highs for him. Pelech was 9-45-54 which also were career highs for him as Pelech looks to finish 3rd among OHL defensemen in scoring. Cristoval Nieves (NYR 2012 2nd) had a primary assist in his Michigan Wolverine's 6-2 win over the Minnesota Golden Gophers. For Nieves it was his 18th assist and it came on Michigan's 5th goal of the game and improves Nieves to 3-18-21. For Minnesota Taylor Cammarata (NYI 2013 3rd) was demoted to the 4th line and was scoreless. Adam Tambellini (NYR 2013 3rd) had a secondary assist as his Calgary Hitmen spanked Mackenzie Skapski (NYR 2013 6th) and his Kootenay Ice 6-3. For Tambellini, the assist was his 22nd and his 39th point since joining the Hitmen. Those are very solid numbers for a guy who only played 31 games. Skapski did not make it through this game for the 2nd straight game as he was yanked after giving up 4 goals on 12 shots and just barely over 28 minutes. Skapski has lost 3 of his last 4 starts which is not a good way to head into the playoffs. Skapski finishes the regular season 28-20-2-2 with a 2.70 goals against and a 0.916 save percentage. To make matters worse for Skapski and his Ice is that they fell to 6th place in the WHL's Eastern Conference and will face these same Calgary Hitmen in the first round. If Skapski doesn't find his game again then this series will not last very long. Griffin Reinhart (NYI 2012 1st) was scoreless as his Edmonton Oil Kings clinched their 3rd straight WHL's Eastern Conference Championship with a 7-4 win over the Red Deer Rebels. Reinhart may not have scored but he was a big reason why Red Deer went 0 for 5 on their power plays. Edmonton has 1 game remaining on Sunday against the Rebels and while it is meaningless to them; they can determine who they face in the first round of the WHL playoffs. Defeat Red Deer and they will face Prince Albert, lose and Red Deer and Prince Albert will be forced to play a tiebreaker game on Monday. Ryan Graves (NYR 2013 4th) was scoreless on 4 shots with a +1 and 1 hit as his Val-d'Or Foreurs defeated the Sherbrooke Phoenix 6-0. The win was the 5th straight for the Foreurs who will finish 3rd overall in the QMJHL and face the Acadie-Bathurst Titan in the first round of the QMJHL playoffs. Steven Fogarty (NYR 2011 3rd) was scoreless and a -1 as his 11th ranked Notre Dame Fighting Irish dropped game 2 of their Hockey East playoff series to 2nd ranked Boston College 4-2. This will set up a winner take all game 3 on Sunday at Boston College. Notre Dame even if they lose this series should wind up with an invite to the NCAA Tournament as their record is strong enough. Jesse Graham (NYI 2012 6th) sat out what was a very emotional game for his Saginaw Spirits as they played their first home game since the discovery of Terry Trafford's death. Got to mention that the London Knights deserve a stick tap for coming out on the ice first in order to salute the Spirit team and then to shake each player's hand. London won 6-2 but this game was more about giving the Spirit players and their fans a chance to come together to grieve over a senseless loss of a young man. Trafford's services will be held Tuesday in Toronto and it is expected that the other 19 OHL teams will be there to show support to the Trafford family and the Spirit players.